Abstract: Hot electron effects in graphene are significant because of graphene’s small electronic heat capacity and weak electron-phonon coupling, yet the dynamics and cooling mechanisms of hot electrons in graphene are not completely understood. We describe a novel photocurrent spectroscopy method that uses the mixing of continuous-wave lasers in a graphene photothermal detector to measure the frequency dependence and nonlinearity of hot-electron cooling in graphene as a function of the carrier concentration and temperature. 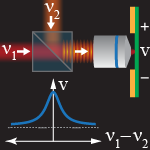 The method offers unparalleled sensitivity to the nonlinearity, and probes the ultrafast cooling of hot carriers with an optical fluence that is orders of magnitude smaller than in conventional time-domain methods, allowing for accurate characterization of electron-phonon cooling near charge neutrality. Our measurements reveal that near the charge neutral point the nonlinear power dependence of the electron cooling is dominated by disorder-assisted collisions, while at higher carrier concentrations conventional momentum-conserving cooling prevails in the nonlinear dependence. The relative contribution of these competing mechanisms can be electrostatically tuned through the application of a gate voltage-an effect that is unique to graphene.